I have been having a lot of ups and downs when it comes to my blood sugar levels. In the mornings, I always tend to have low (if not extremely low) blood sugar levels — hence why my boyfriend has made it his priority to make sure I am awake and eating breakfast before he leaves for work. I haven’t been using my Dexcom Seven Plus CGM (continuous glucose monitor) recently, firstly because I ran out of sensors, and then secondly because my charging cord broke. I guess I have started to become lazy in a sense, because even now that I have everything back in order — I still have yet to put it on! 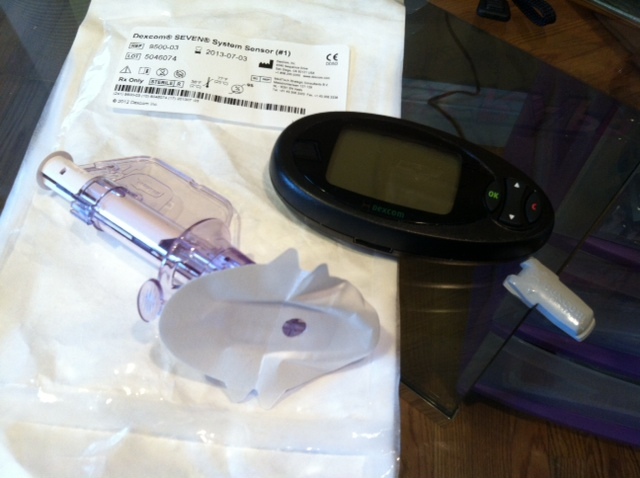 Decom CGM and all of its components (Sensor, Transmitter and Receiver). This past week, I downloaded all of my blood sugars and insulin readings to my computer. The program automatically sorted my blood sugar levels as “Extremely low,” “Low,” “Normal,” “High,” and “Excessively High.” My “Normal” range is between 80-160 mg/dL. I was shocked to see them all over the place —- with only a few in the green or “Normal” areas! Now that I am really that much more aware of how much my sugar levels are out of control, I need to get back onto a good track. No wonder my doctor says I am “uncontrolled.” It is time to stay healthy. I need to get more active. I need to control my blood sugar levels better and I need a good A1c level. Welcome back into my life Dexcom SEVEN PLUS CGM. ← Why Support JDRF in the Walk to Cure Diabetes? Very serious business, I hope you get it back in control soon.